I made some cheesecake. Most cold cheesecakes have eggs or are gelatin based. I tried out the cheesecake using agar agar flakes and loved the end result. Instead of cream cheese I used curd cheese. It is pretty difficult getting some decent cream cheese in Mombasa. I used about 2 litres of yogurt to get the required amount of curd cheese. 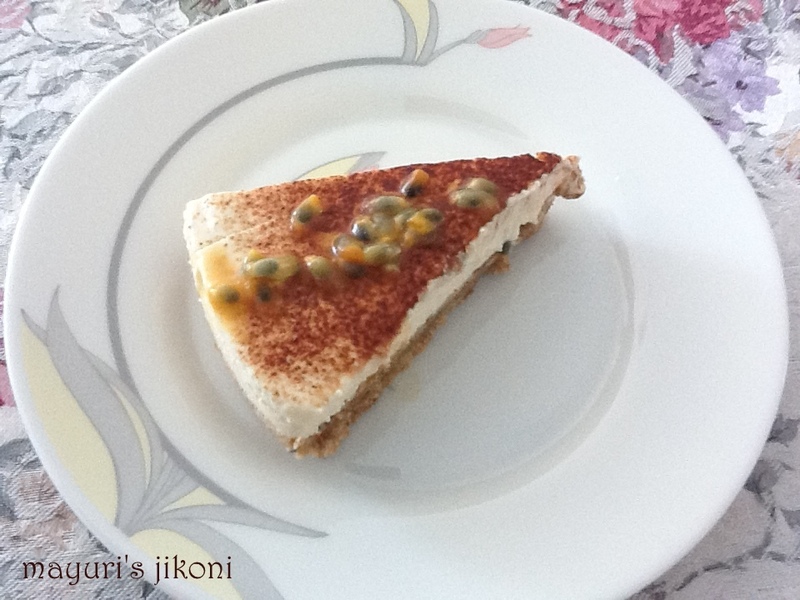 I was pretty adventurous in trying out a passion fruit flavour cheese cake, but hey it worked. Crush the biscuits using a food processor or a big ziploc bag and a rolling pin. Add the melted butter to the biscuit crumbs and mix well. Take a 9 or 10 inch round spring form cake tin. Press the crumb mixture onto the base of the tin. Press it in gently. Put the tin in the freezer till required. Soak agar agar in the water for 10 minutes in a small pan. Bring the mixture to a gentle boil till the agar agar dissolves. Leave the mixture on the side but it should not become cold. Gently heat the passion fruit concentrate. Add the agar agar mixture to it. If you are using home made curd cheese, make sure it is not watery. Should have a crumbly texture. Add sugar to the curd cheese. Whisk it with an electric whisk till it becomes smooth. Whip the fresh cream till it forms soft peaks. Add the hot agar agar mixture to the curd cheese mixture and whisk it. Add the whipped cream and passion fruit pulp. Mix well. Pour the filling over the biscuit crumb base. Level the top gently and put the cheesecake in the fridge to set. This will take about 4 to 5 hours but I let mine set overnight. Before serving, decorate the top as you like. Use ginger nut biscuits or chocolate biscuits for the base. If the agar agar sets, heat it up again before mixing it with the filling. To get a crumbly curd cheese, I put the yogurt in a thin cotton cloth. I place it on a wad of newspaper and also place newspaper on top. Then I put a heavy brick on it. The newspaper soaks up the water. Once the newspapers are wet, replace them with dry ones. Then I let the curd cheese sit in the fridge overnight in the cloth. For the topping, use extra passion fruit pulp, grated chocolate, any other fresh fruit etc. To get a passion fruit concentrate, take about 1/2 kg of passion fruit. Take out the pulp. Put the pulp in the blender without any water. Blend it for a few seconds. Sieve the mixture. You will be left with the concentrated juice. Measure the concentrate in a cup. Add half the amount of sugar. Mix well. Remainder of the concentrate can be diluted to make a refreshing drink. Ready made concentrate is available in most Indian grocery shops in UK. Adjust the amount of sugar used in the filling according to your taste.